Serving our German-influenced fare Monday through Thursday from 4pm-10pm, Fridays 4pm-11pm, Saturdays 11am-11pm and Sundays from 11am-9pm. Von Trier is proudly serving German-influenced food. We pride ourselves on using the highest quality meats, sausages, fresh ingredients, and local bakery to create a uniquely special, German-inspired culinary experience. 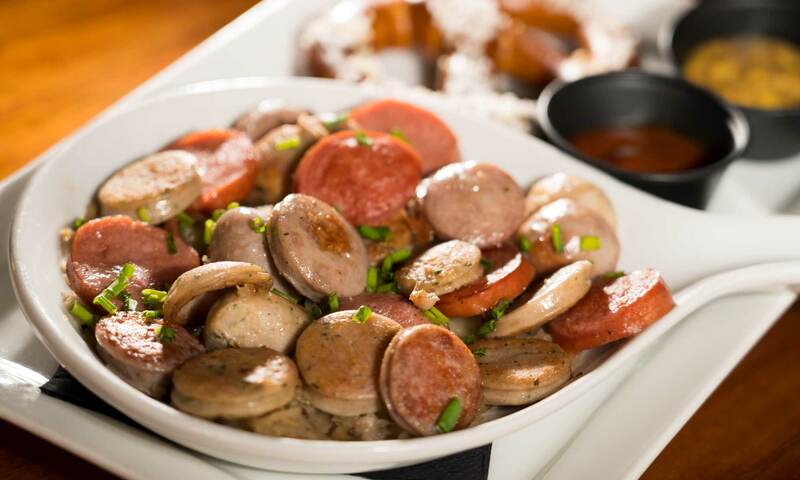 With the classic German Wursts including our very own Von Trier Bitburger Beer Bratwust, Ney's Big Sky Weisswurst, and Usinger's Knackwurst, Von Trier sets the bar for the classic German fare. We also feature unique, rotating sausages from Foltz Family Market in Milwaukee's Third Ward, Chef Martin, and from Ney's Big Sky Ranch out of Slinger, WI. Our custom burger blend from Ney's Big Sky is a selection of grass-fed, pasture-raised beef, antibiotic and chemical-free consisting primarily of brisket, sirloin, and tri-tip cuts. For vegetarians, we offer the immensely popular Impossible Burger, produced with a plant-derived Heme that gives the veggie burger the taste and texture of meat. Small Snacks, Appetizers, and Large Sharable Items. Locally baked Miller Baking large pretzel served with house-made Obatzda cheese, sweet imported Handlemeier Mustard and spicy imported Lowensenf Mustard. Sliced Bavarian Bratwurst, Knackwurst, and Weisswurst grilled and served on a bed of Sauerkraut, with a side of imported Mittelscharf Mustard, tangy Curry Ketchup, and a small pretzel. The ultimate Von Trier Sharable; Roth Buttermilk Bleu, Hooks 5 Year Cheddar, and Young Gouda cheeses along with Creminelli Proscuitto, Rushing Waters Smoked Trout, and Smoked Coppa served with black pepper crackers, imported Mittelscharf Mustard, toasted almonds, tomato jam, sliced apples, pickled whole-grain mustard seeds, Greek olive mix, and house pickles. Perfect for snacking and sharing. Roth Buttermilk Bleu, Hooks 5 Year Cheddar, and young gouda with black pepper crackers, house pickles, Mittelscharf Mustard, sliced apples, toasted almonds, and tomato jam. 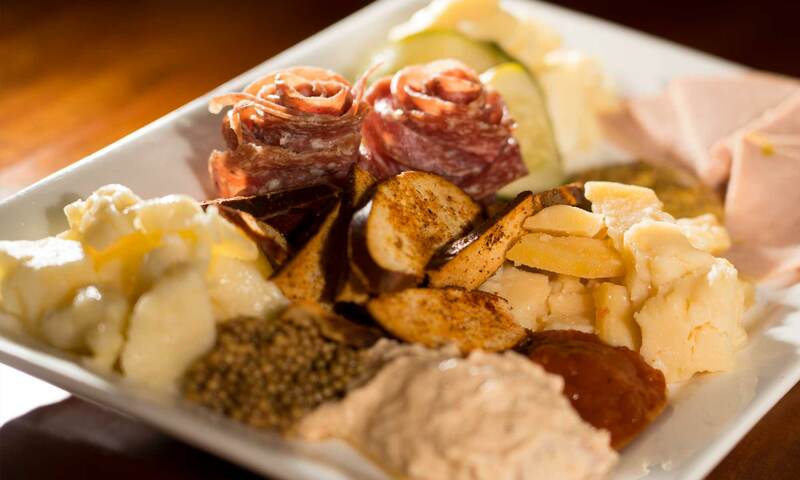 Creminelli Proscuitto, Rushing Waters Smoked Trout, and Smoked Coppa with house pickles, pickled mustard seeds, sliced apples, Mittelscharf Mustard, and black pepper crackers. Usinger’s Braunschweiger liverwurst served with marble rye bread, red onion, and imported Mittelscharf Mustard. Spiral-cut white daikon radish served Highland rye bread, butter, and salt. The perfect palette cleanser for a good German Bier. Two flayed and pan-fried curry sausages served over house-made curry ketchup and curry powder with a small pretzel and mustard. Highland Baking Marble Rye paired with our house made Obatzda and garlic chive butter. 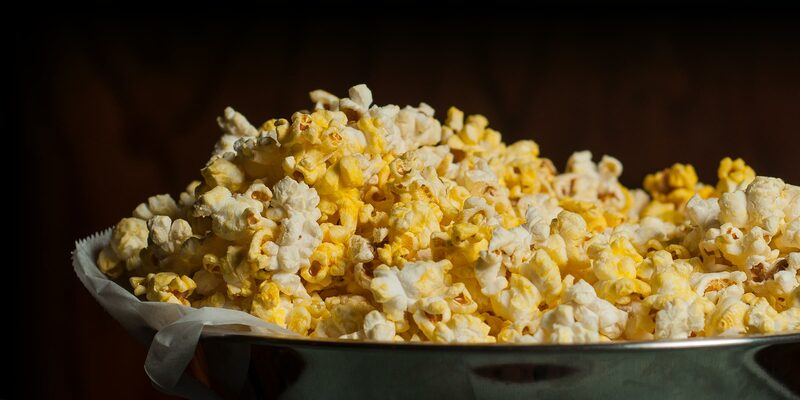 The perfect light Von Trier snack. All three of our German sausages including the Von Trier Bratwurst, Knackwurst, and Weisswurst served with Highland marble rye, Usinger’s Sauerkraut, and Red Cabbage with imported sweet Handelmeier and spicy imported Lowensenf mustards on the side. Sweet corn, house-made spätzle, spinach, and brussel sprouts with orange zest and coriander dressing topped with Parmesan cheese. Bright and hearty fall salad. 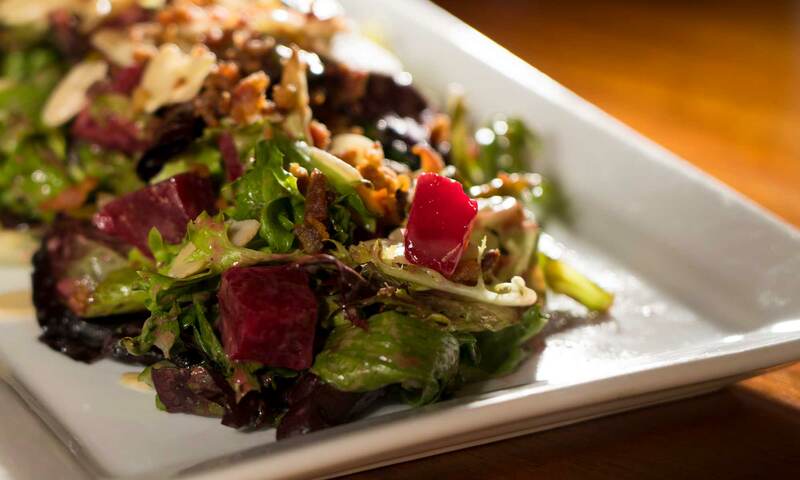 Romaine lettuce, sliced cucumbers, spiral-cut daikon radish, red onion and rye croutons with our rich, house-made dill dressing. Brats, beef and beer chili with veggies, peppers, tomatoes, and beans topped with munster cheese and Bavarian sauerkraut. Hearty and comforting with just a touch of spice. Caramelized onions with white wine vinegar make for a bright German twist on the classic French soup, topped with Parmesan cheese. German-inspired Culinary Creations and Center of Plate Items. 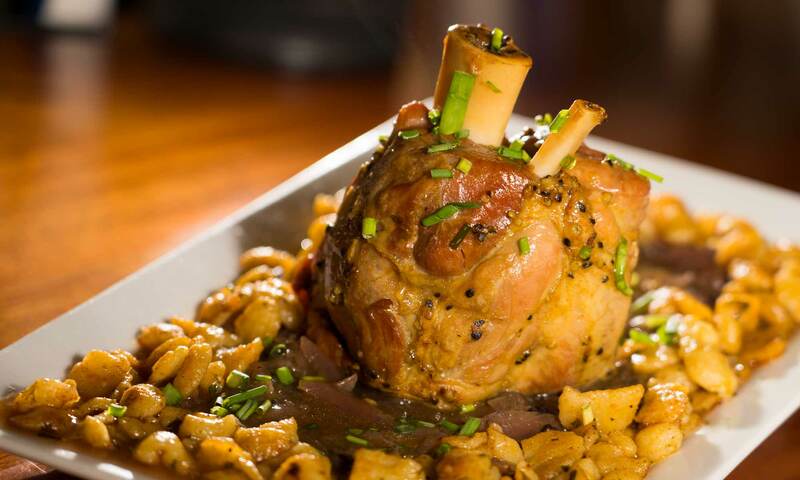 A German delicacy; delicious and tender 20oz bone-in Pork Shank served over sautéed spätzle, smothered in delicate demi-glace, with house-made red cabbage. Miniature house-made meatloaf served with our Korbel mushroom gravy over a bed of sautéed spätzle with a side of Brussels sprouts; our twist on two great classic comfort foods. All three of our German sausages including our Bratwurst, Knackwurst, and Weisswurst served with Highland marble rye, German Potato Salad, Usinger’s Sauerkraut, and Red Cabbage with imported sweet Handelmeier and spicy imported Lowensenf mustards on the side. A variety of high-quality sausages from local vendors including Usinger’s, Ney’s Big Sky, and Foltz Family Market. Von Trier’s specially-made bratwurst by Foltz family market, grilled and served on a brat roll with Bavarian Sauerkraut, Doppelbock Caramelized Onions, and spicy imported Lowensenf mustard with your choice of side. Poached and grilled Weisswurst served on a Miller Baking Company Pretzel Roll with sautéed onions, Bavarian sauerkraut, and sweet imported Handelmeier Mustard with your choice of side. Usinger’s Classic Knackwurst served on a pretzel roll with sautéed onions, Bavarian sauerkraut, and Mittelscharf Mustard with your choice of side. Sides include our house-made VT Roasted Potatoes (v), Kettle Chips (v), Red Cabbage ($1) (v), Bavarian Sauerkraut ($1), house-made German Potato Salad ($1), Brussels sprouts ($1) (v), Side Cucumber Salad ($3) (v) , or a cup of either of our soups ($4). Burgers and German-inspired sandwiches. Add an extra patty to your burger for $3. Gluten Free Bun options available. Our custom burger blend smashed and grilled to perfection with Butterkäse cheese, house-made Tomato Jam, crispy bacon, sautéed mushrooms, and carmelized onions served on a Butter Brioche Bun. Make it egg-celent with a fried egg for $1 more. Our custom burger blend smashed and grilled butter burger style with Butterkäse cheese, butter, tomato, red onion, house pickles, and chopped Romaine lettuce with our house fancy sauce served on a Highland Butter Brioche Bun. 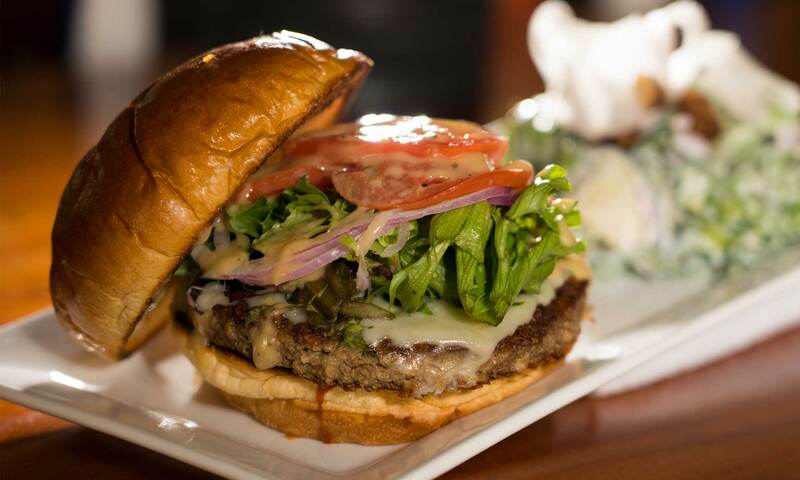 Simply put, this is just a really good Butter Burger; our custom burger blend smashed and grilled to perfection with Butterkäse cheese, butter, and Romaine lettuce served on a Butter Brioche Bun. A veggie burger this incredible should be Impossible; the Impossible Burger grilled to perfection available as any of our aforementioned burgers. 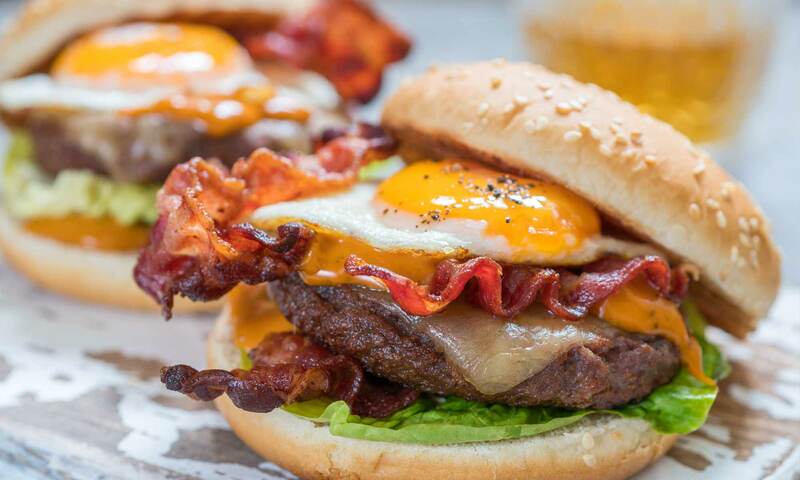 Try the Trier Burger impossible style (without bacon!) or either of our aforementioned Butter Burgers. Pan-fried, tenderized pork cutlets breaded with pretzels with lemon aioli, romaine lettuce, tomato, and red onions served on a Miller Baking pretzel bun along with your choice of side. Make this Schnitzel a la Holstein with the addition of a sunny side up egg! A German chicken sandwich that would make Omi proud. Marjoram herb and beer braised chicken thighs with apple mostarda and house pickles on a pretzel roll served with your choice of side. Our take on the classic Reuben; house-braised corned beef, Bavarian sauerkraut, and swiss beer cheese sauce served on marbled rye with a side of house fancy sauce for dipping with your choice of side. Our take on the classic Grilled Cheese; Clock Shadow Creamery’s Munster and Butterkäse cheeses grilled on sourdough bread with our house-made tomato jam on the side. Add bacon or portabella mushrooms (or both!) Includes your choice of side. Sides include our house-made VT Roasted Potatoes (v), Kettle Chips (v), Red Cabbage ($1) (v), Bavarian Sauerkraut ($1), house-made German Potato Salad ($1), Brussels sprouts ($1) (v), Side Cucumber Salad ($3) (v), or a cup of either of our soups ($4). Join us for our brunch offerings from 11am-3pm. Poached and grilled Weisswurst, two eggs, small soft pretzel, and sweet Handelmeier mustard. Served with VT breakfast potatoes or your choice of side. Our house burger blend smashed and grilled with bacon, munster cheese, Doppelbock caramelized onions, and an over easy egg on a pretzel bun. Served with VT breakfast potatoes or your choice of side. Roasted VT breakfast potatoes, corned beef, sautéed peppers and onions with two eggs sunny side up. Mushroom, peppers, eggs, tomato jam, and cheese in a light, fluffy pastry baked to perfection served with VT breakfast potatoes or your choice of side. Gluten Free Bun options available!